(partial) Plenary sessions. Closing session. Review papers. Voltage control. Data administration and exchange. Stability (I). Modelling of generating plant (I). Stability (II). Modelling of generating plant (II). Security-analysis and monitoring. Power systems modelling. Emergency and restoration. Planning and operating tools. Power plant control (I). Power system control (I). Power plant control (II). Power system control (II). Economic optimization. Expert systems applications. State estimation. Training simulators. Author index. Keyword index. The control of power systems and power plants is a subject of worldwide interest which continues to sustain a high level of research, development and application. 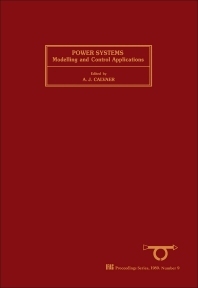 Papers pertaining to areas directly related to power systems and representing the state-of-the-art methods are included in this volume. The topics covered include security analysis, dynamic state estimation, voltage control, power plant control, stability analysis, data communication, expert systems and training simulators for power plants. This interchange between those involved in the research and those involved in the practical applications of new ideas and developments provide a comprehensive reference source for all involved in the power industry. For systems designers, control engineers and all those working within the field of power plant technology.